You will be accompanied by one of our qualified staff members through your paintball experience. They will be running the games and ensuring you are having a fun, safe and exciting paintball experience! Your first outing with us is going to be a blast! Your paintball marker will fire paintballs at about 200 miles per hour! Just firing the paintball marker will get your adrenaline pumping! Once you are playing you will be shooting at opponents, with them firing back! This means paintballs will be whizzing by you! We Recommend Arriving 30-minutes prior to your start time. This gives you time to complete your waiver, get checked-in, and go through our 5-7 minute Safety Briefing & Game Orientation. Upon arrival you will have to “check-in.” This process includes filling out a waiver. Every player has to fill out a waiver. After completing your waiver you will then check-in with our staff. Following check-in you will go through our 5-7 minute Safety Briefing & Game Orientation. After you are checked in you will go through our 5-7 minute Safety Briefing & Game Orientation. The briefing will go over the paintball mask, the paintball marker, the games, and how everything works at the facility! After the Safety Briefing & Game Orientation you will be issued your equipment & taken out to our Staging Area to prepare for your games! After you have settled into the staging area, which has tables for you to use between games, the referees will then organize the games. If you are a Private Group you will have a referee assigned to your group that will set you up. If you are a part of the Open Session the referees will announce to all Open Session players which field the game will be on and direct players to that field. Prior to the game the referee will set and explain the game mode, then split teams. After teams are split the players will head to their start station so the referee can start the game. How Many Games Will I Play? The typical game at the Indoor Arena lasts 2-5 minutes, while the typical game at the Outdoor Park lasts 5-15 minutes. Because of this we have found most players play 8-12 games per hour at the Indoor Arena and 4-8 games per hour at the Outdoor Park. 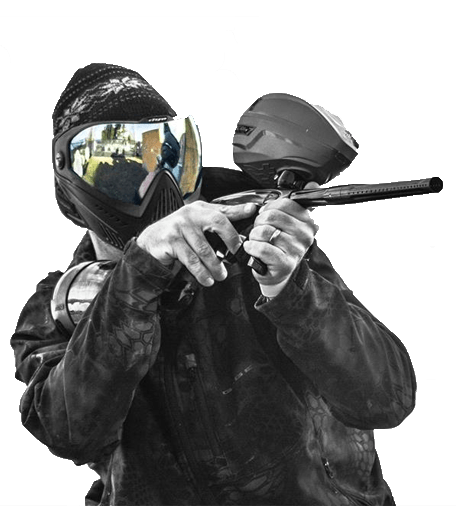 Once your play time is up or you are out of paintballs (you can buy more on site) then you can turn the equipment back in at the Check-In. Again, we recommend a change of clothes for the ride home! At both facilities we have large bathrooms that you can use to change in.